Oishii Bwyty - Kyonoki in the kitchen. Ta'miyya are Egyptian fried bean and sesame croquettes. They are a staple food in Egypt and derive their meaning from an Arabic word meaning nourishment. There may be quite a few steps in making the croquettes, but the most fiddly (and thus difficult) part by far is shelling your broad beans. If you are using frozen broad beans make sure they are defrosted before you start. Don't worry if you forget, simply put them in a bowl, cover with boiling water, leave for a minute and then drain. Peel the beans (this takes a little time) and along with the peeled garlic cloves blend in the food processor. To this mix add the beaten egg and parsley to create a bright green paste. You may need to stir the paste away from the sides and blitz again to make sure you are not left with any lumps. Transfer the mix to a large bowl and add the flour, bread and seasoning. Divide the paste into 8-10 pieces and with your hands shape each one into a fat disk. Try to make sure that you push out any air that may be trapped in the disks as if left it may explode out during frying. Roll the disks in a bowl of the sesame seeds until completely coated. 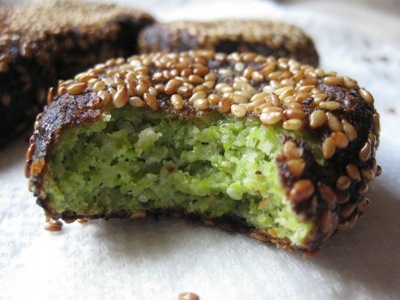 In a pan fry the ta'miyya until golden brown (they will start off a deep green and as the frying progresses you will see the green slowly disappear), turning over every now and again. Pluck from the pan and place on a bed of kitchen roll to drain off any excess oil. Dab with more kitchen roll and serve hot. Place each ta'miyya on a lettuce leaf. This allows your guest to pick up the food without getting his/her hands greasy and adds to the sweet bean taste. Oishii Bwyty – Kyonoki in the kitchen. None of our recipes require SPAM, so we want to block it with this silly question.